Please don’t judge me. For the first time ever, I’m going to unveil one of my deepest secrets. I admit – I’m an addict. I’m addicted to exploring and seeing places that inspire creativity. I’m addicted to experiencing something new and crazily fun. And, I’m addicted to natural spectacles that mesmerize its beholders, such as Tinuy-an Falls and Hinatuan Enchanted River. There are so many places in the Philippines that have fed my travel addiction and have left me spellbound. From lush and picture-perfect hills to gleaming skyscrapers, I’ve left my heart in dozens of wondrous places across our beautifully diverse archipelago. And, one of the places that swept me into pure bliss is Surigao del Sur. 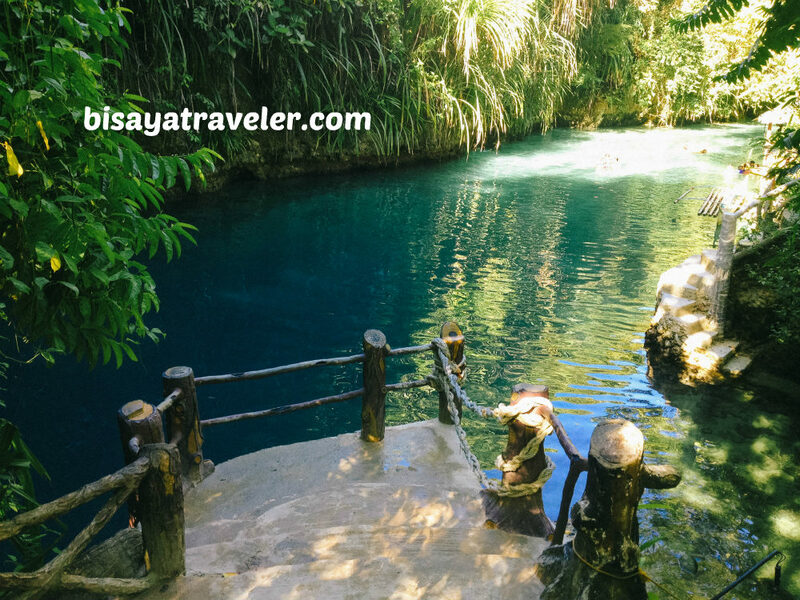 Not only did it captivate me with its easygoing vibe, but it also took my breath away with its striking wonders – Hinatuan Enchanted River and Tinuy-an Falls. As a matter of fact, I think I’m even deeply and genuinely addicted to the charm and beauty of this province in Mindanao. A couple of months ago, my wife’s cousin from the US, Diane Marie, planned a trip to Tandag to visit our relatives Surigao del Sur. And, guess what? She also had plans visiting the Hinatuan Enchanted River and Tinuy-an Falls. And, with our impulse to travel, we answered a resounding “yes” to Diane’s invitation. 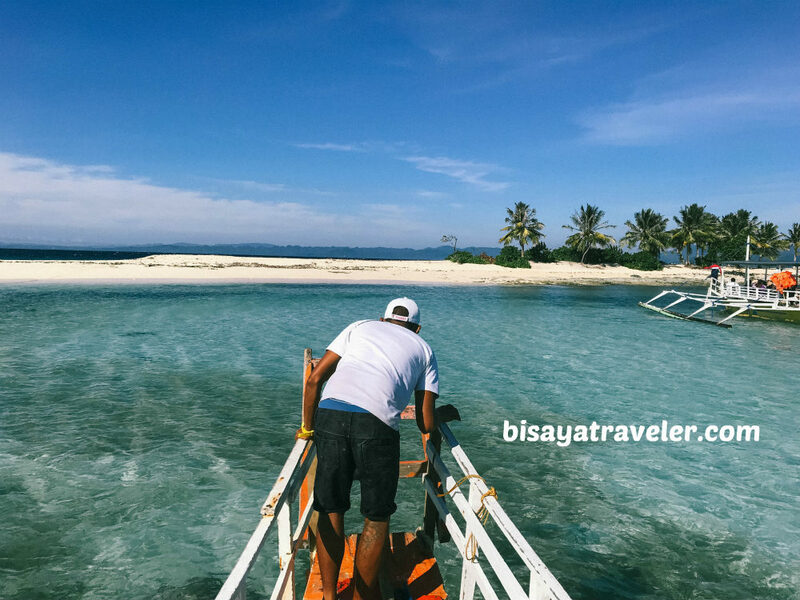 So, we ventured into Mindanao, to catch up with our relatives and experience these enticing attractions in Surigao del Sur. Our Surigao del Sur adventure started with a rendezvous with Diane in Capitol area, Cebu. From there, we took a taxi cab ride to Mactan International Airport. 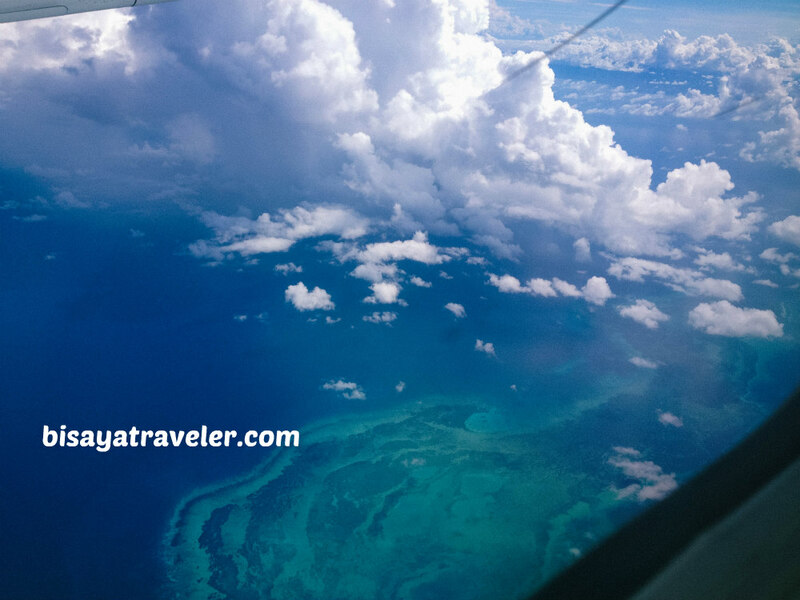 A few hours later, we boarded a Philippine Airline aircraft bound for Butuan Bancasi Airport where kuya Reginald and ate Jeneffer were waiting for us. They, then, took us to Robinsons Place Butuan where we chilled and ate our lunch. With our stomachs full and energies replenished, we hit the snaking road to Tandag from Butuan. 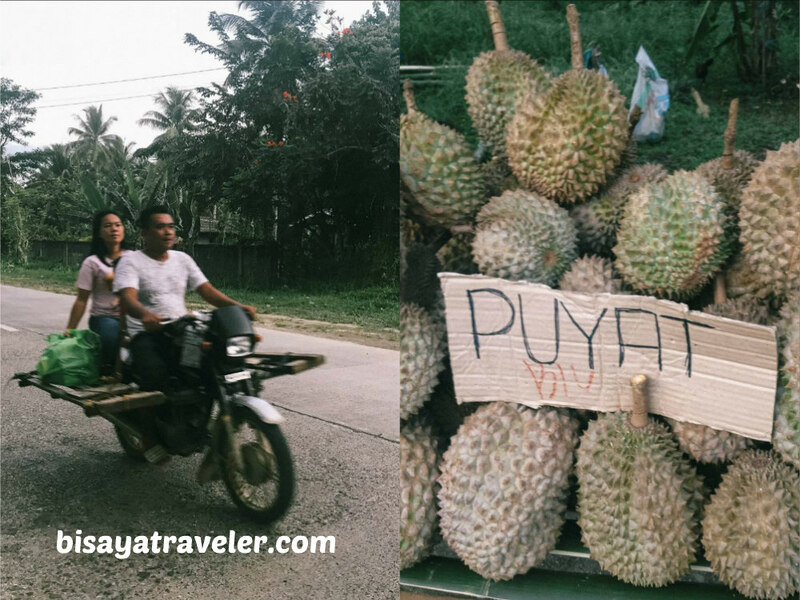 Along the way, we made stops, for bathroom breaks as well as to savor Mindanao’s fresh produce, such as the famous Durian. And, it was indeed a wonderful culinary experience, especially for Diane who ate a freshly plucked Durian for the first time. While it wasn’t my first time to savor this fruit, I was a little addicted to its chewy texture and moderately sweet taste. Ultimately, we arrived at Tiya (aunt in English) Insik’s house in San Agustin, Tandag. What’s more, I got to meet the other members of the Lamela clan. Tired from our whole day trip, we slept early, so we can have tons of energy for our visit to Tinuy-an Falls and Hinatuan Enchanted River. The following day, we woke up early, and prepared our stuff for the upcoming adventure. 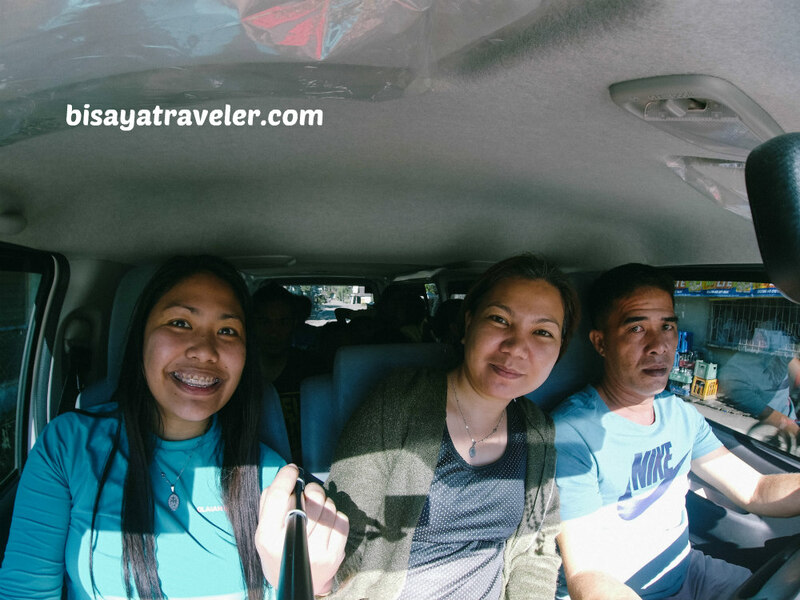 With Kuyra Reginald’s cushy van, we took a ride to the first stop of our Surigao del Sur getaway – Tinuy-an Falls. 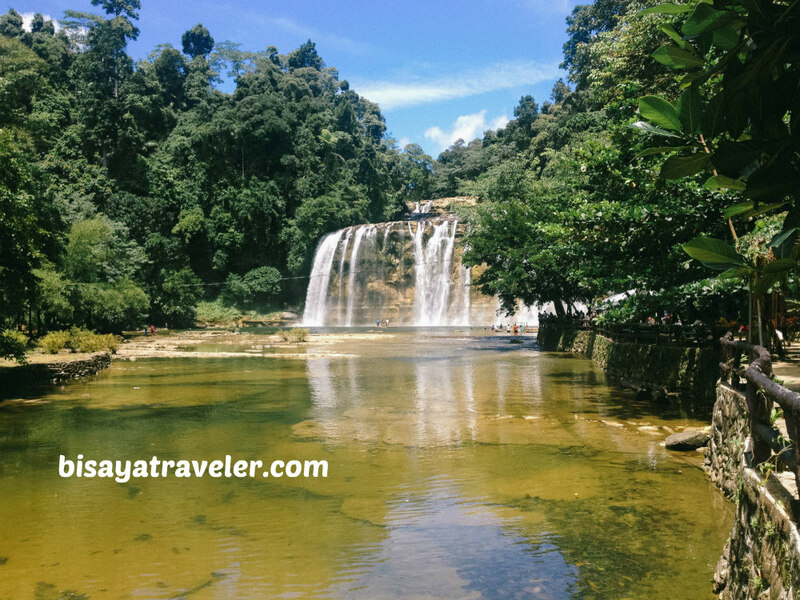 After a short drive in Surigao del Sur, we arrived at the gateway of Tinuy-an Falls. There, I officially met Kuya Toto and his family. And, surprisingly, the road to Tinuy-an Falls was pretty developed and smooth, unlike some of the waterfalls in the Philippines that I’ve visited recently. As far as I can remember, there were no bumps or rough paths leading to Tinuy-an Falls. Upon our arrival at the registration center, I was amazed by the width and grandeur of Tinuy-an Falls. 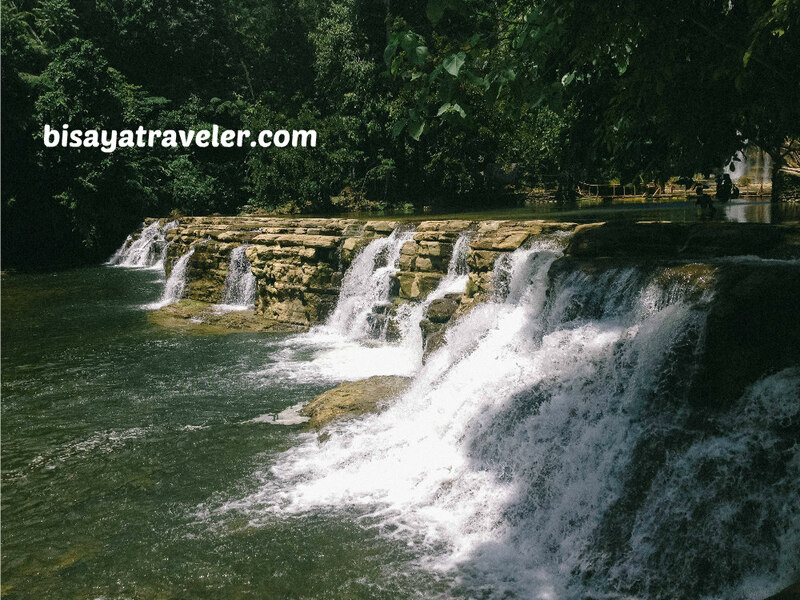 No wonder they call it as the “little Niagara Falls of the Philippines”! Geared up and thrilled for the fun moments, we entered the facility and paid the necessary fees. And, I was gazing in amazement, as I was making our way to the cottage, carrying a gallon of water. 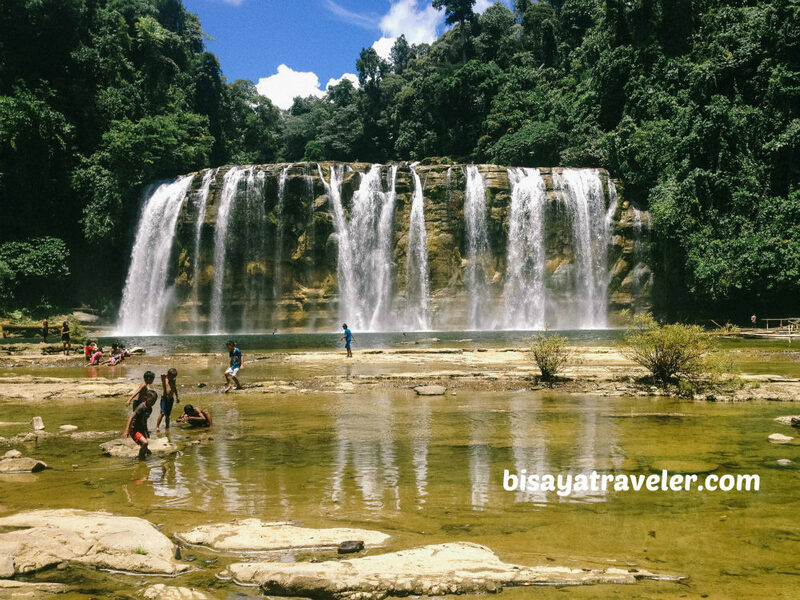 With its towering height and impressive width, Tinuy-an Falls looks like a wider version of Bohol’s Can-Umantad Falls. 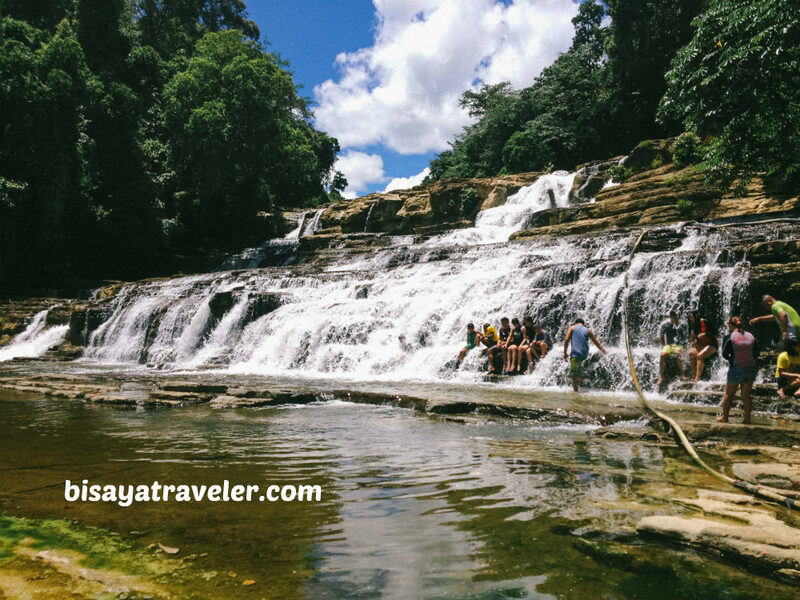 Trust me, the beauty of Tinuy-an Falls is addicting, enticing and jaw-dropping, even when viewed from afar. 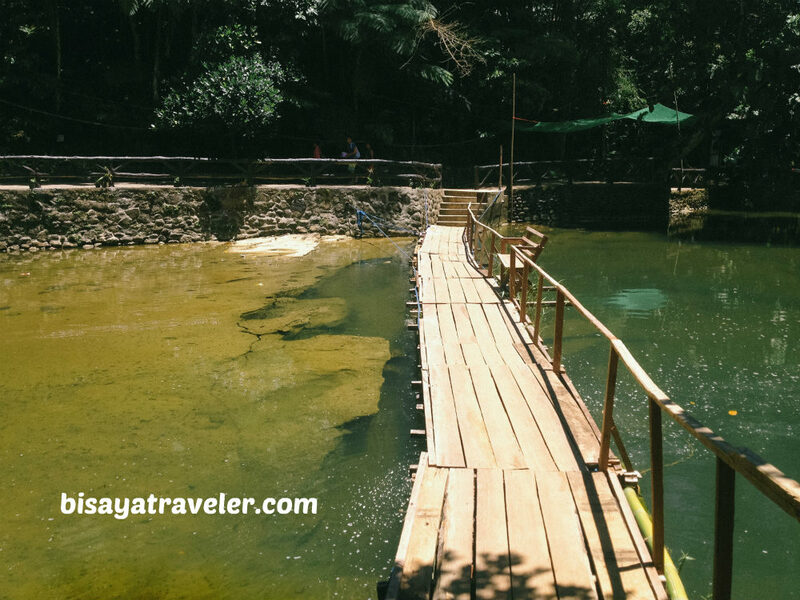 From our cottage, we walked our way to the docking area of its bamboo raft to get a closer look of Tinuy-an Falls. As you might have guessed, we spent some time snapping photos as well as admiring its addictive grandeur. Later on, I went to the other side of Tinuy-an Falls via a wooden bridge, and took a handful of photographs. The way I see it, this side has better and more beguiling angles of Tinuy-an Falls. Besides the awe-inspiring sight, I also caught glimpse of the other facilities in Tinuy-an Falls, including a children’s playground. Yep, a playground with swings! Since it was almost lunchtime, I returned to the cottage and indulged on a tasty and hearty lunch. From the crispy lechon to the flavorful kinilaw, we had a mishmash of choices of food for our lunch. Even my wife, who has lost her appetite for pork dishes, enjoyed every bite of the tasty lechon. As for me, I was also addicted to the taste of their lechon. It’s, hands down, one of the best-tasting lechons (outside Cebu) that I’ve ever sampled. 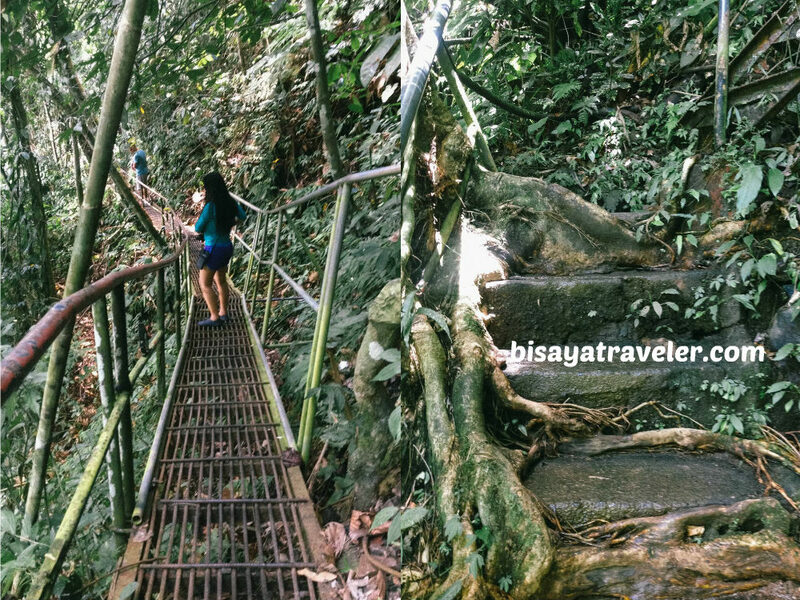 With lunchtime in the books, we, spearheaded by a local guide, hit the concrete and steel stairway leading to the other levels of Tinuy-an Falls. Once again, I was stunned by the extraordinary rock formations and flowing waters of Tinuy-an Falls, the moment we arrived at the higher level. The perfectly carved rocks and gorgeous cascade prove that our creator is a brilliant and creative artist or engineer. Honestly, I can spend hours here just soaking up the scenery and taking pictures. If only I had Picasso’s eyes and hands, I’d spend the whole day in Tinuy-an Falls, painting a masterpiece. 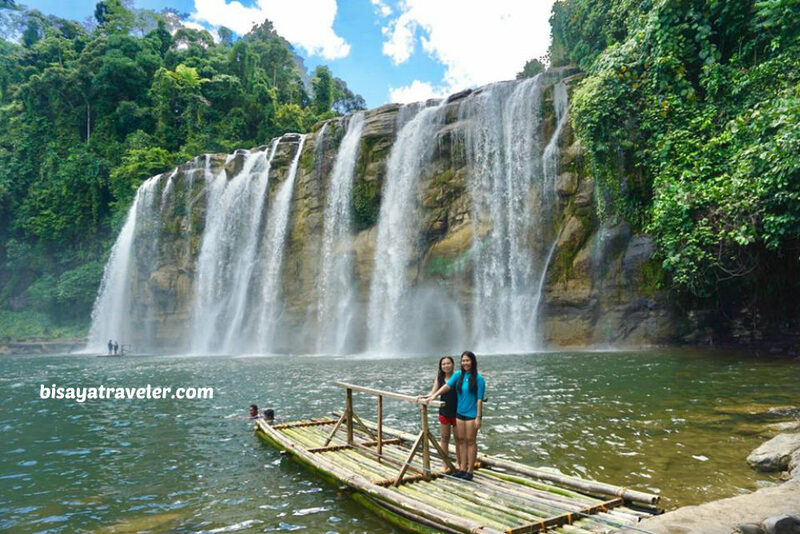 And, it’s not just the visual appeal of Tinuy-an Falls that makes this Surigao del Sur attraction so tempting and addictive. Moments later, we found ourselves sitting below one of the tiers, enjoying a refreshing massage from Mother Nature herself. How did the natural massage therapy feel? Simply glorious! All the stress, muscles aches and headaches accumulated throughout the past weeks were gone in a flash, with this extraordinary massage. Quite a stress reliever, I must say. Afterwards, we descended from the higher tiers of Tinuy-an Falls and packed up our stuff, so we can move on with our Surigao day trip. When people mention Surigao del Sur, the first thing that usually comes into my mind is the Hinatuan Enchanted River. For years, the enticing Enchanted River has been luring me with its mystical cerulean water. And, yes, my expectations were rather high, before leaving for Surigao del Sur. 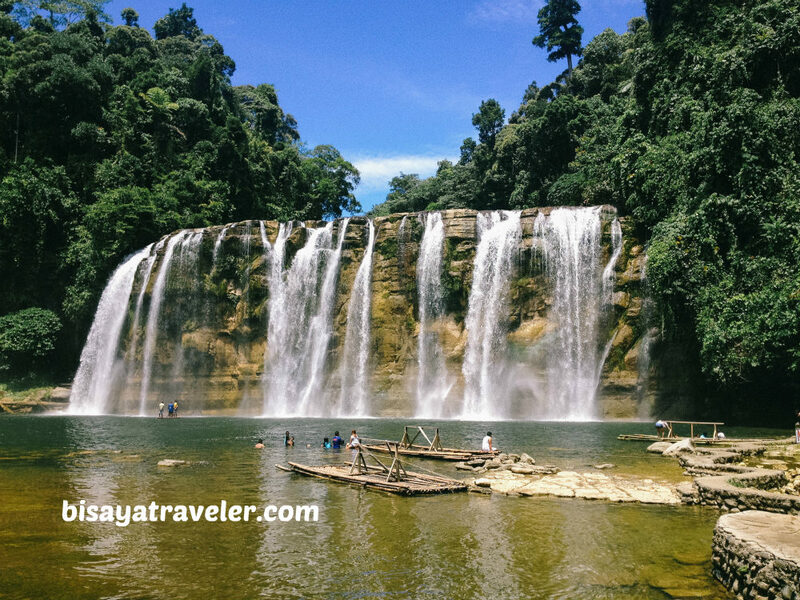 I thought it was the highlight or the ultimate pit stop on our Surigao del Sur travel itinerary. Unfortunately, it was not a good day to visit Hinatuan Enchanted River. 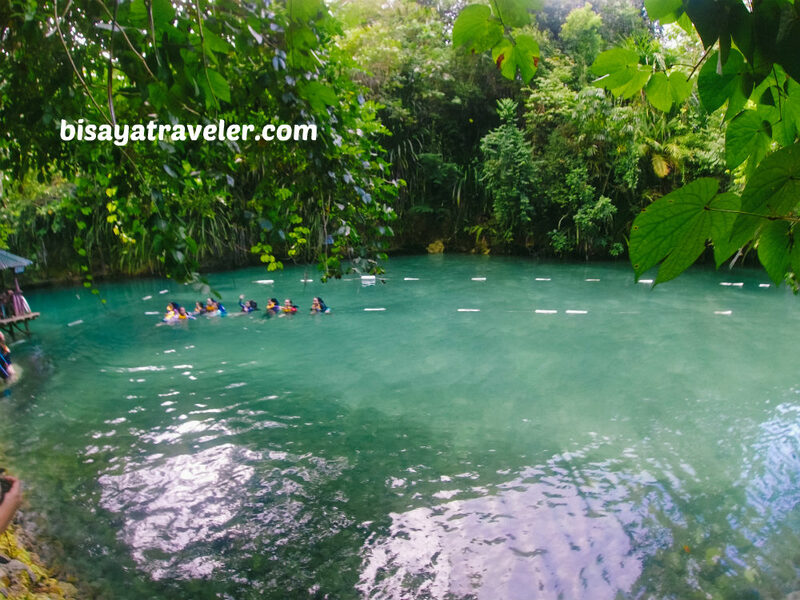 With gloomy skies and not-so clean waters, we didn’t get to see the full splendor of Hinatuan Enchanted River. As what I’ve learned later on, the water wasn’t as blue as usual because of the recent tropical typhoons that hit Surigao. Plus, it was a bit dark, when we arrived, meaning the sun couldn’t showcase its real beauty. 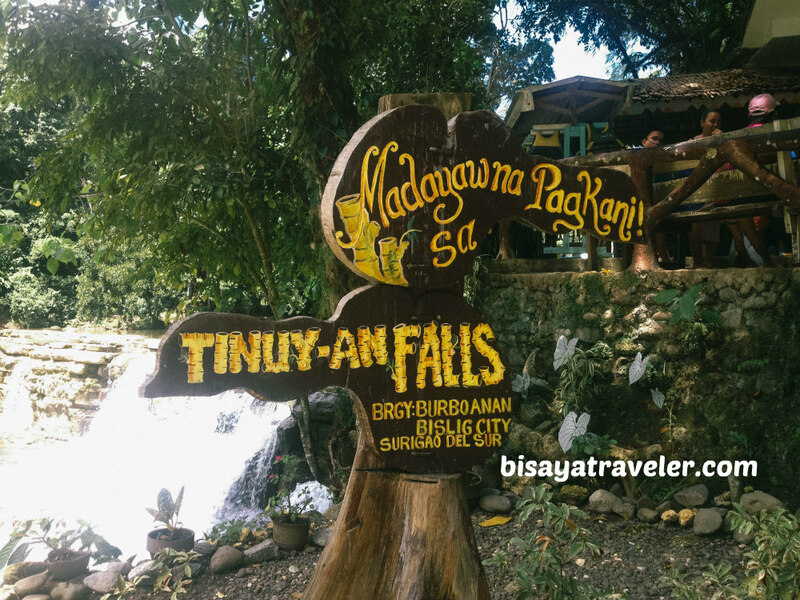 Nevertheless, we had a fun checking out this one-of-a-kind attraction in Hinatuan. Even though we had some confusion on the registration center, we still nailed it, thanks to the optimistic and sprightly people on this trip. Was the river as sight to behold? 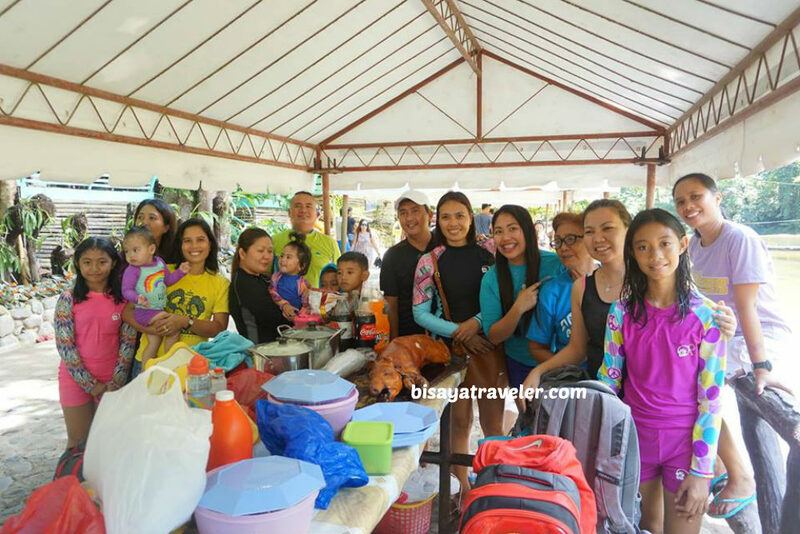 Not really, but the combination of the people’s smiles, upbeat outlook and fascinating stories made it a worthwhile stop on our Surigao del Sur travel itinerary. As I’ve said before, it’s not the destination that makes the trip memorable, but the people whom your share your moments with. And truth be told, it’s not as bad as it seems. On the bright side, I, at least, have a reason to return to Hinatuan Enchanted River and Surigao del Sur. 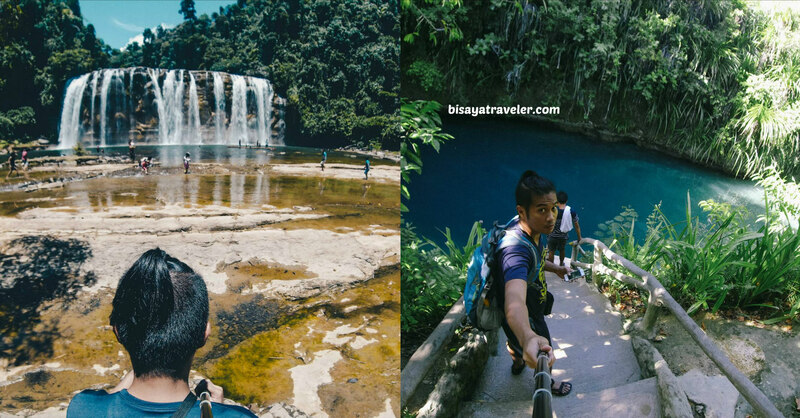 With our relatives on the lead, we followed the path that would lead us to one of the best surprises of our Surigao del Sur trip – Sibadan. Once we’ve agreed on a price with the boat operator, we wasted no time, and traveled to Sibadan Fish Cage. 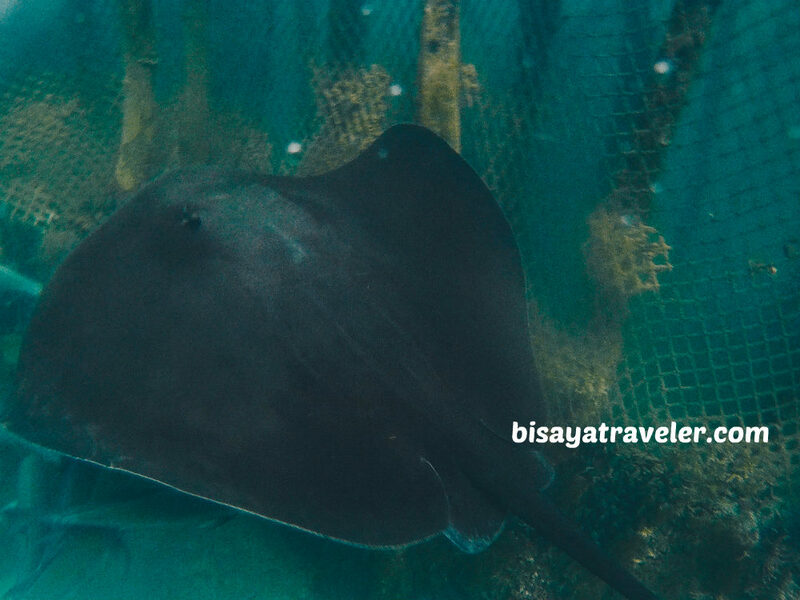 I was kind of familiar of Sibadan Fish Cage, and its friendly star sting ray, Brenda. 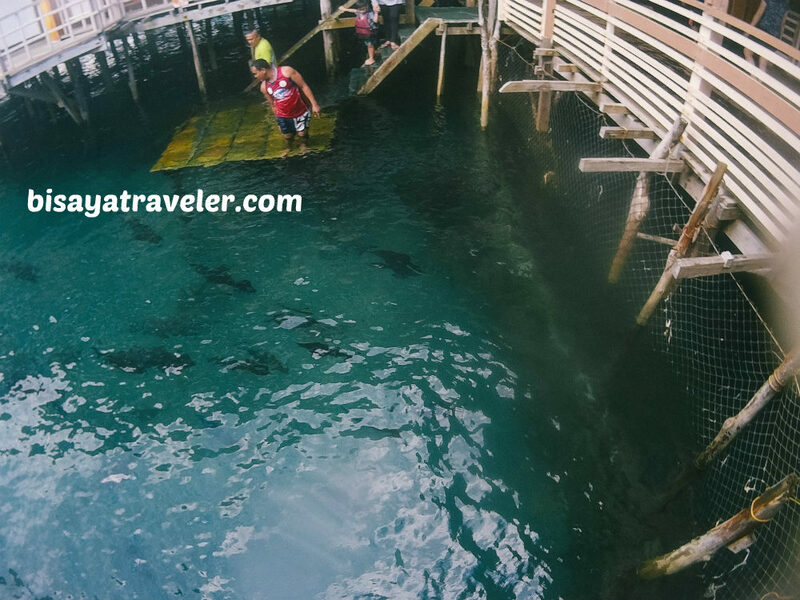 The truth is, I thought Sibadan Fish Cage was somewhat far from Hinatuan Enchanted River. And, that’s why I was pleasantly shocked, when I realized we were headed to Sibadan Fish Cage. With our admission fees settled, I grabbed a bunch of life vests from our pump-boat, to get a chance to swim my Brenda. From above, Brenda was fairly easy to spot. 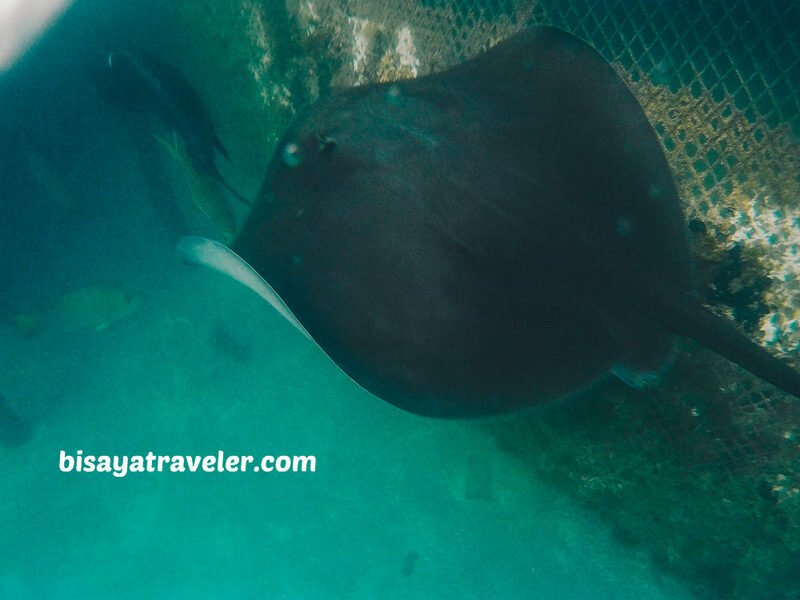 With her impressive size, anyone can easily see this humongous sting ray when viewed from the restaurant area. But, it’s a totally different story, when you’re swimming with her inside the cage. Although the cage is small, you’ll definitely have a tough time getting an up close look of her, when she’s away from the stairs and decks. Psyched and curious, Diane burned a plethora of calories, chasing the elusive and playful Brenda. And, for some reason, it was also an incredibly addicting experience. 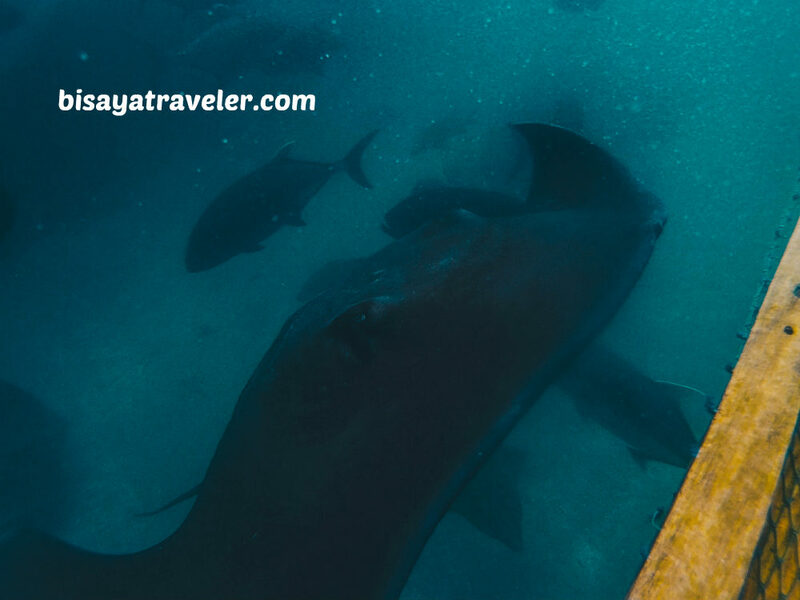 Maybe, it was the thrill of swimming with a baby shark and giant stingray or diving into the unknown. 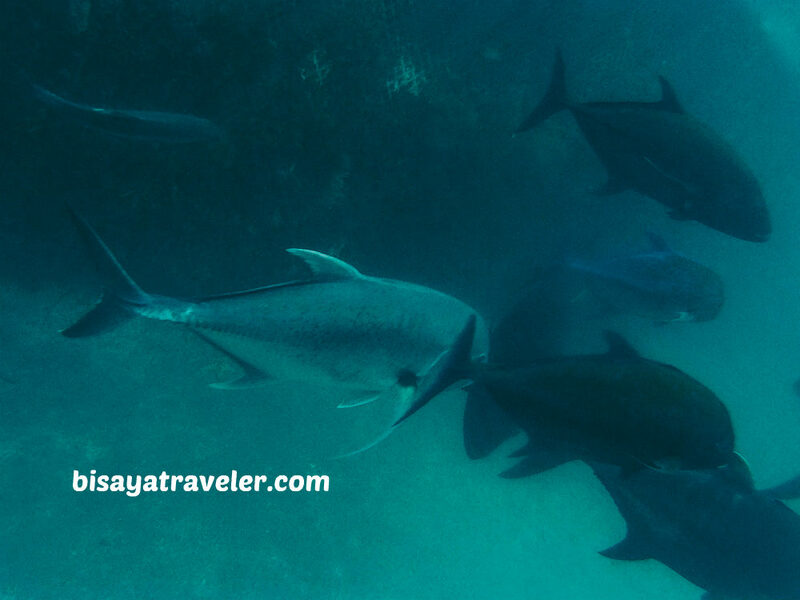 Even though I’ve dived with whale sharks and schools of sardines before, I did find it pretty amusing and exciting. 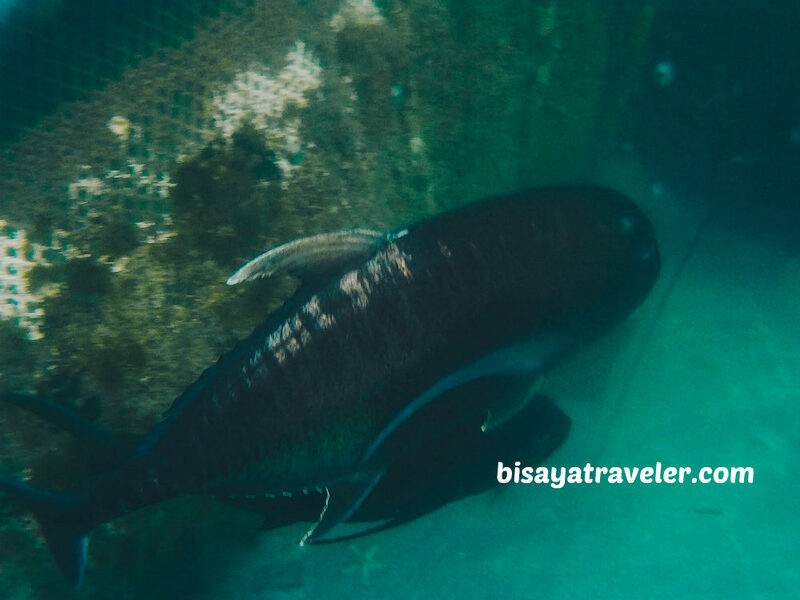 And, there were some big fish inside the cage too, which looked kind of scary at times. Eventually, Brenda gave in to our plea, and gently approached everyone near the stairs. 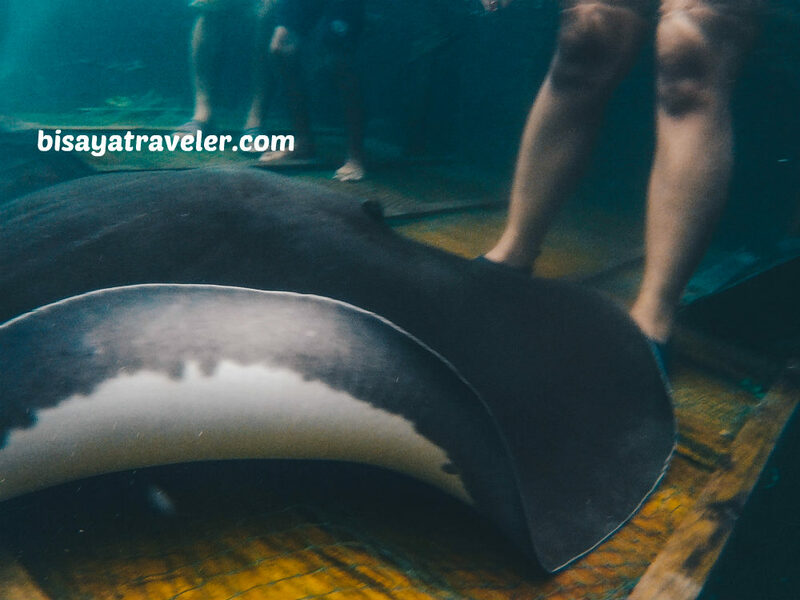 She’s, by far, the friendliest and most charming stingray I’ve ever seen. I know she’s a friendly gal, but I did keep my distance from here. We all know what happened to the legendary Steve Irwin, right? As addicting and mind-blowing as this experience, safety should be the main priority. 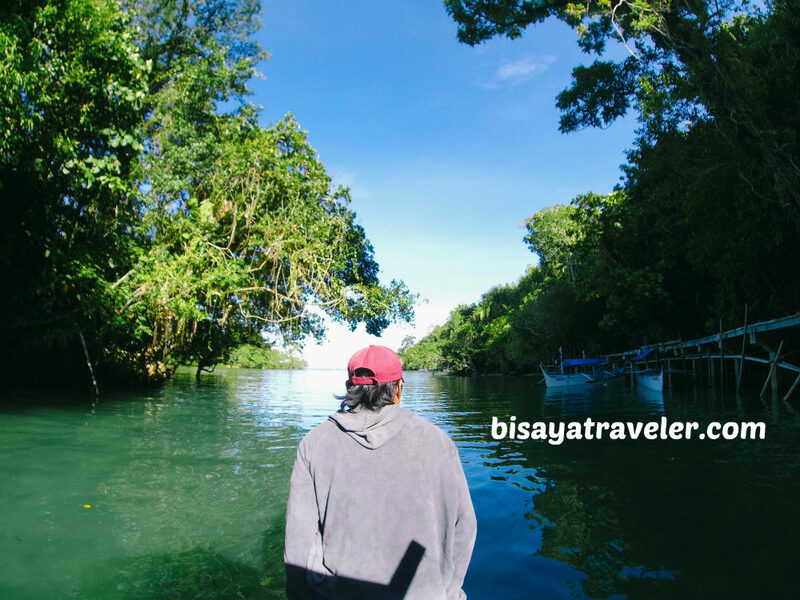 With the sun about to set, we sailed our way back Hinatuan Enchanted River, to take a plunge on its ice-cold and rejuvenating brackish water. And, it was, for me, the perfect way to cap off an exciting day trip in Surigao on a high note. The next day, we explored the majestic and pristine Britania Group of Islands, which I will soon share on my blog. And, that was an amazingly addictive experience too. 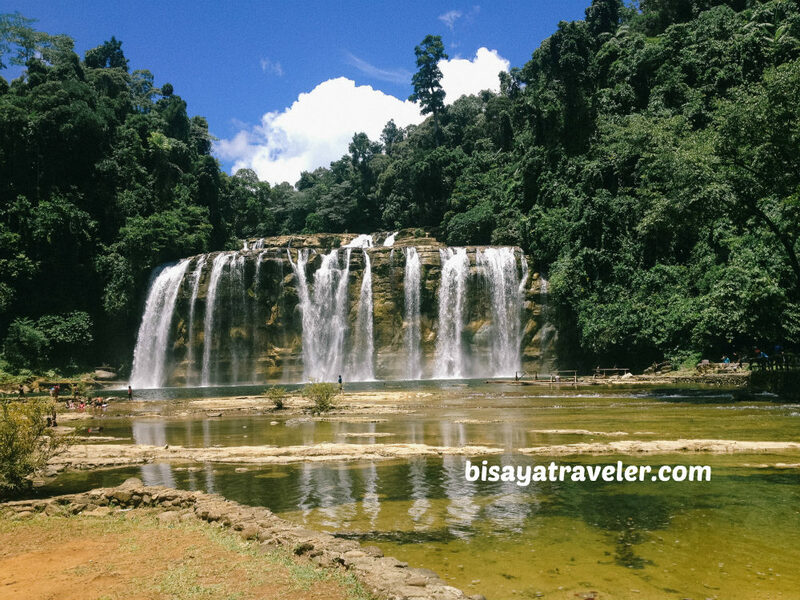 To get to Tinuy-an Falls, first you need to travel to either Butuan City. From Butuan, there are buses and vans that can take you to the jump off point – Bislig city’s Barangay Mangagoy. Travel time is about 5 hours, and fare is PHP 200 per person for vans and PHP 250 per person for non-aircon buses. Upon your arrival in Mangagoy, charter a habal-habal that will take you to Tinuy-an Falls. Travel time is 30 to 40 minutes, and rate for a round-trip ride starts at PHP 300. From Butuan, take a bus or van that will take you to Mangagoy (see above). There, charter a habal-habal that will take you to the Enchanted River. Normally, roundtrip rate starts at PHP 300 for every motorcycle (good for 3 passengers). Sometimes, drivers charge PHP 100 for waiting. What’s the most convenient way experience them? As you can see, getting to these places can be a little bit tough, especially if you’re not used to the art of DIY traveling. If you’re looking for a more convenient way to explore these places, rent a van. Prices are affordable and can accommodate a group of travelers. Contact Tickets to Ride, if you’re planning to take this option. And, the thing is, I’m not just addicted to the beauty of Tinuy-an Falls And Enchanted River. I’m addicted to the fresh sea breeze of Surigao del Sur. 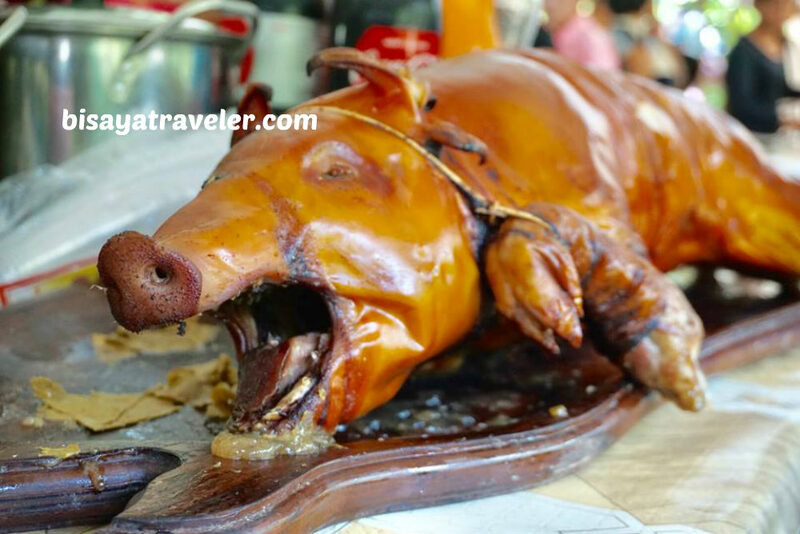 I’m addicted to Surigao’s lechon, fresh seafood and tangy fruits. I’m addicted to its traffic-free streets. I’m addicted to its serenity and laid-back charm. 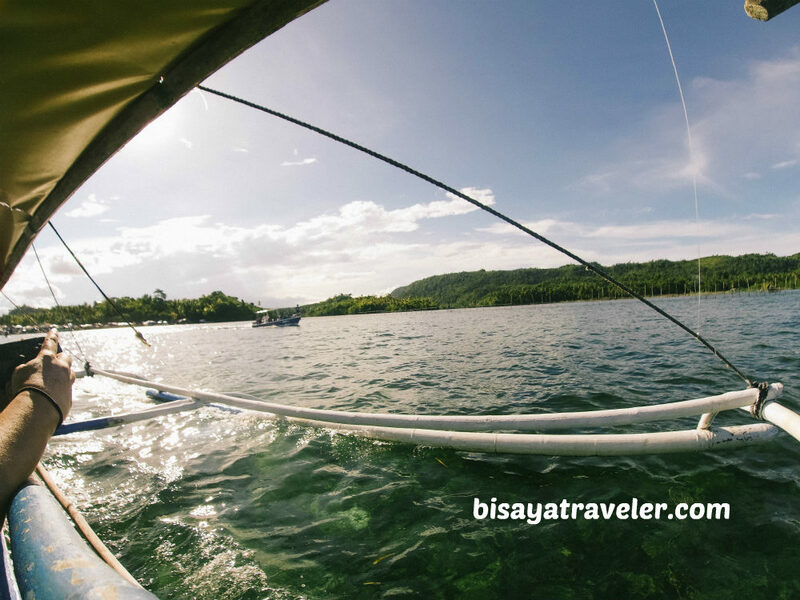 I’m addicted to the potential outdoor adventures in Surigao del Sur. And more importantly, I’m addicted to the hospitality and generosity of the Lamela clan and the Surigaonons. Truthfully, it was the people on our trip that made our Surigao escapade fantastic and memorable. In my book, these people are the true wonders of Surigao del Sur.